Thank you very much Martin for this new mail! 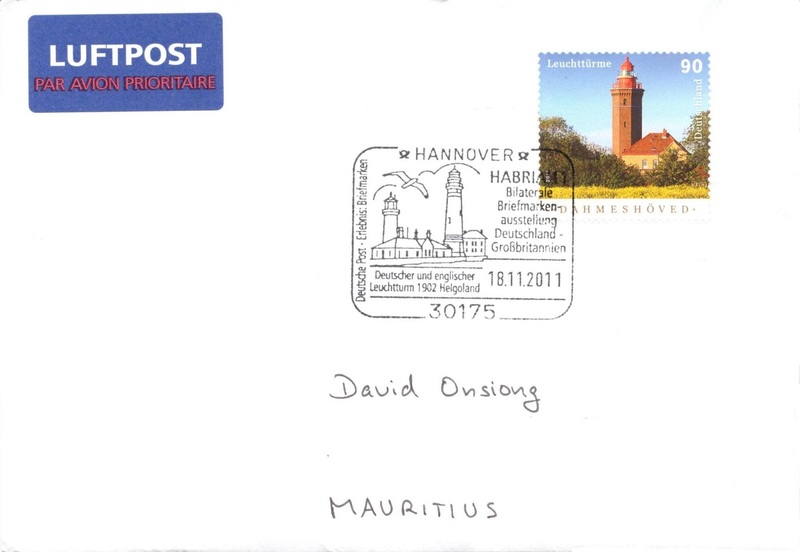 :) It features a special pictorial postmark marking the participation of the Deutsche Post at the HABRIA 11 Bilateral Stamp Exhibition (18-20 November 2011) held by the Hanover Stamp Club of 1886 at the Hanover Congress Centrum. Exhibitors from the UK and Germany participated in this event. 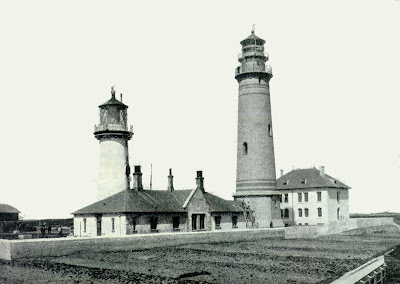 The Old Heligoland Lighthouse in 1903. The postmark represents the old Heligoland Lighthouse (German Leuchtturm Helgoland), located on Germany's only offshore island, Heligoland. The Prussian administration ordered the construction of a new lighthouse in 1902, to replace an even older one built by the British when Heligoland was under their rule. The lighthouse was in service from 1902 until its destruction during World War II in 1945. A square-shaped anti-aircraft tower made of heavily reinforced concrete was the only building to resist the bombings and was converted into a makeshift lighthouse in 1952. The stamp depicts the Dahmeshöved Lighthouse, from the 2011 Lighthouse series (Date of Issue: July 7). This lighthouse is situated in northern Germany on the Baltic Sea coast.